Well that was easy. As there is only one recognized species in all of North America, and because it is so common, I feel the need to delve a little deeper. But first note that varieties don't make much difference. They're just common combinations of morphological traits that represent but a fraction of the genetic diversity within a single species. In theory there should be hybrids to every one of these found somewhere. There are no less than 10 described varieties of this one species. And after reviewing what's written about them below it seems clear that some of these may well be elevated to species status. Of the 10 I feel only 5 are really distinct. These are Prenolepis imparis itself, var. testacea, var. coloradensis, var. arizonica, and var. californica. I say they're worth mentioning because there are a reasonable amount of pictures online to link to, to get a general idea of them. The others (var. minuta, var. pumila, var. veracruzensis, var. colimana, and var. nitens) are considered rare and some seem to be smaller versions of the before mentioned. The genus as a whole is associated with oak trees. They're found as far north as Nova Scotia and as south to Guatemala. They're not common in the Rocky Mountains at all and down south in Mexico they seem to only be found at high elevations where it remains cool for a period of months. While they'll accept dead insects as food their main food source seems to be assorted carbohydrates. They forage mainly for nectar in flowers, extra floral nectar from plant pores, honey dew from aphids and scales etc..., galls (but these can be the result of an aphid anyhow) and they'll even go for elaiosome from seeds when they can get it. Despite this affinity for sweets it's strange that they do not take advantage of underground aphids as subterranean Lasius do. 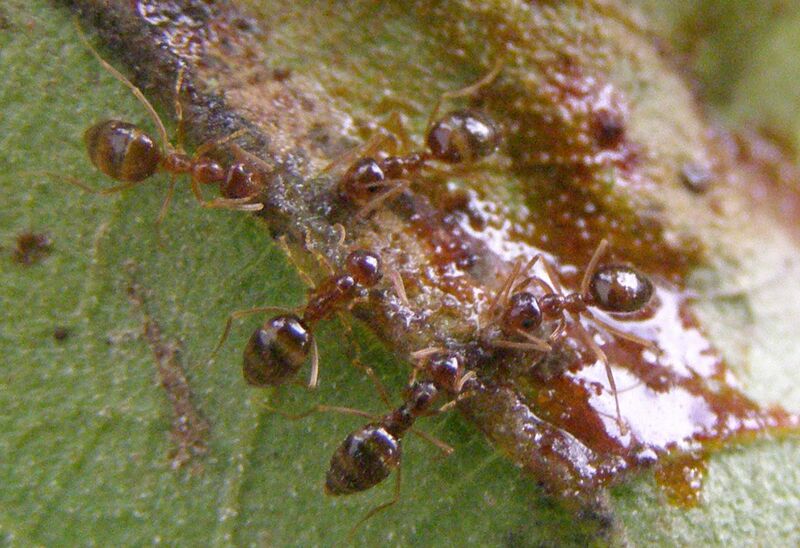 While collecting food workers often balloon up with food and are technically considered repletes similar to Honey Pot Ants, Myrmecocystus. 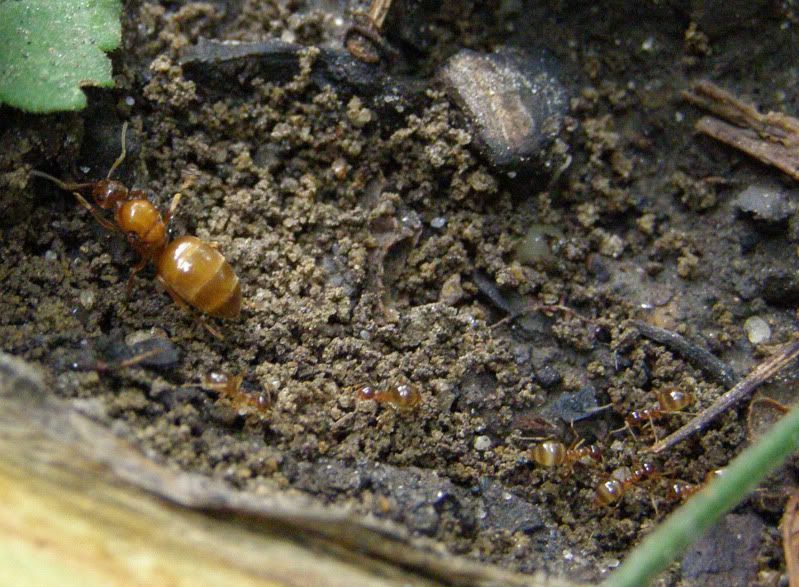 Unlike Honey Pot Ants, Prenolepis imparis repletes are still able to move and are frequently seen in foraging trails wobbling about. 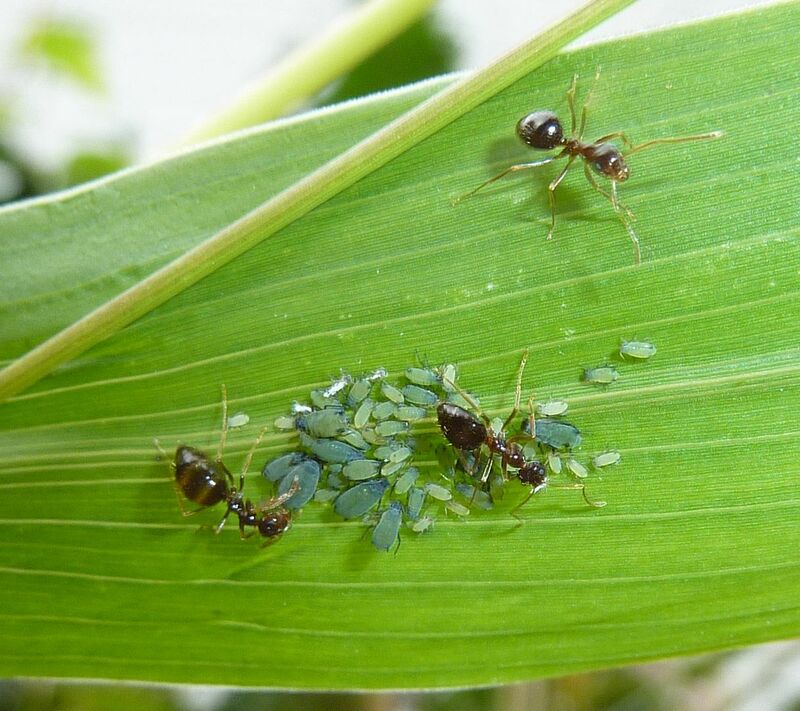 Also unlike Honey Pot Ants rather than leaving it as a sugar within their social stomach the food is converted into a fat body. This is where they get the common name False Honey Ant. Personally I'm not a fan of this common name though and believe it implies a certain image of the species promoted by the pest control industry. I feel the name Winter Ant is a bit more appropriate because of their extreme tolerance to cold. Not only have they been reported foraging when it's only 6 degrees Fahrenheit out! but also hold their nuptial flights sooner than any other species in temperate areas, where they're found. In the study listed below the earliest date for a nuptial flight is mentioned in March, but I've seen them out as early as February 11th. They did not fly again until March 11th, and then not after that until the end of March where they continued to mid April. Up north they may continue flying as late as early May but certainly not any longer. This happens typically on the earliest day of the year where temperatures are in the 60's or above. Wind conditions don't seem to matter as long as the gusts aren't dropping the temperature below favorable conditions. I've seen them out flying on days with gusts were blowing 60mph. The only other condition is the soil must be somewhat moist, either by melting snow, or from rains earlier in the week. Flights take place in the afternoon at first but as good days happen these become sooner and sooner to slightly before 12:00 noon. Swarms of males gather around trees and foliage, often at eye level, where they mysteriously appear to be marking the foliage. 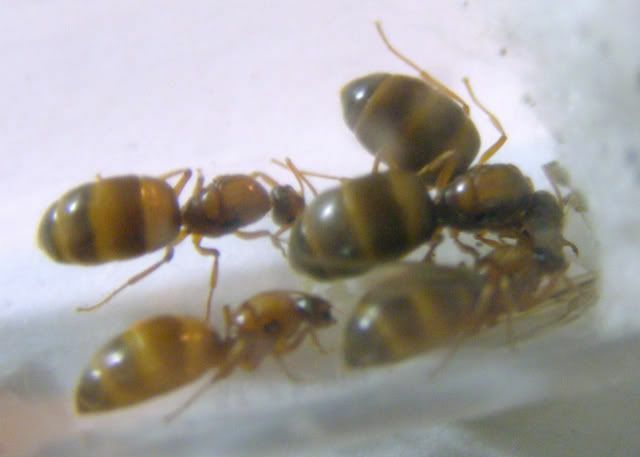 Queens are far fewer in number and quickly pounced upon by males where mating then typically takes place on the ground. Bugguide.net has several pictures of mating couples. (1) (2) (3) The larger the gathering of males the more queens that seem to arrive. I've found swarms that took up several meters of forest land, as well as ones consisting of fewer than 6 males swarming around a tree in my own back yard. Nests are underground, and I want to say not far from where swarms typically gather. From keeping them in captivity, new queens will produce their first workers over the first summer. In just about every study I've read though they all seem to agree that adult colonies don't keep brood over the summer months. So it's unknown where the transition takes place. Brood was only ever found from September to the following March. Over the summer colony activity typically dies down verging on going completely dormant sometimes as long as 8 months. Nests go very deep into the earth, probably deeper than 10' down. See here. Often there is only one entrance, or a second opening close by, certainly not much more. I've also found colonies moving or perhaps combining. 3-4mm long, queen 7.5-8.5mm, male 3.5-4mm. This species has a preference for nesting in moist clay. The head and mesosoma are typically medium brown to solid black. The gaster is always either dark brown or black. The legs, and antenna yellow to yellowish brown. *Here is what I believe is a typical queen coloration to the true species. (1) (2) This should probably be backed up with coloration of the workers too. Notice how they're reddish brown but not to bright, or "pale" as it's described. 2-2.5mm long, queen 6.5mm, male 2.5. This species is described as Prenolepis imparis itself but smaller. Queens are described as slightly paler but still darker than var. testacea. (Also has markings on the mesosoma but honestly I think they all do!) This is described as being rare. *The only reason I'm not dismissing this as someone just finding a young colony of P. imparis that only has nantics is the fact they give a measurement for the queen and male. So this does sound legitimate, rare as it may be. (Presumably the same lengths as P. imparis itself) Prefers nesting in sandy soil or pure sand, though it may also occasionally be found in clay. 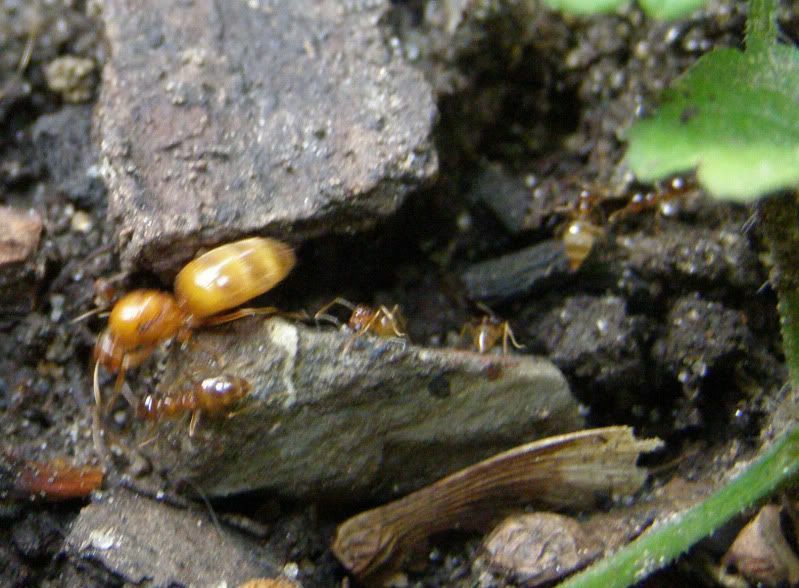 Workers are much paler in color ranging from yellow to brownish red. The gaster and posterior portions of the head are darker than the body, ranging from pale to dark brown. Legs are always yellow. Queens are much paler too with more vibrant yellows and reds, ranging from an almost solid blond color to a brighter form of P. imparis itself as with this one. 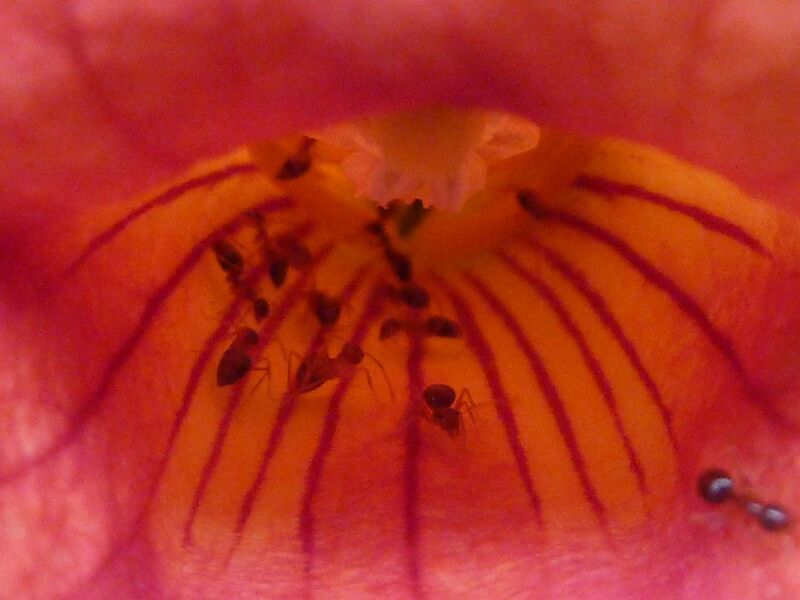 *Queens might be slightly smaller than true P. imparis. I believe I have a picture of the two together here. They failed to produce any workers, or even rear any of the eggs into larva, and died shortly after. 2.2-2.5mm long, queen ?, male 2.3-2.5mm. This is described as a smaller version of var. testacea. Legs and antenna were noticeably pale yellow. This variety is said to be rare. 2.3-2.5mm long, queen 6-6.5mm, male 2.8-3.2mm. Same color as P. imparis but overall darker and perhaps less color variation, usually a glossy brown. They differ also in having longer pubescence on the scape and legs. Queens are also darker, very much more brown looking to almost terracotta and lack the more vibrant reds and yellows of eastern forms. 2.5-3mm long. This variety has only been collected in mountainous areas of Colorado, I'm listing it with a wider distribution becuase these varieties are not well studied and may be found elsewhere. Slightly darker than var. pumila. Body color is brown with the posterior of the head darker. The gaster, antennae, and legs are yellow. 3-3.5mm long, queen 6.5mm, male 2.8-3.2mm. Same color as the darkest form of var. testacea but erect hairs are longer and more abundant on the gaster. 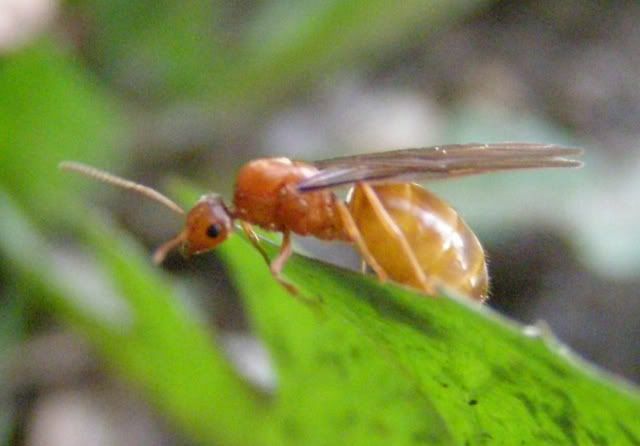 Legs and antennae are brownish yellow. Queen colors is pale/blond as in var. testacea but "no mesosomal markings" (as I said earlier, I think every queen has these, so I'll believe that when I see it). 3mm long. Uniformly brownish red. Tarsi and knee area are yellow. Longer pubescence than var. californica. Erect hairs are longer and more abundant. Pubescence is slightly longer. *Nothing else is known for this variety. 3-3.5mm long. Body is brownish with the posterior of the head and gaster darker. Antennae, tarsi, and tips of femera are paler and more yellow. Erect hairs are longer and more abundant. Pubescence is slightly longer. This is also worth noting. This is not var. californica as it's much smaller in size, and apparently flies in the fall time. Comparison. Read More. Also P. imparis var. nitens isn't found in North America at all from what I read, and in fact has been elevated to species status. Prenolepis nitens. Wheeler, W. M. 1930. The ant Prenolepis imparis Say. Annals of the Entomological Society of America 23: 1-26. I'm not entirely sure. I've certainly seen them out in temperatures below 42 Fahrenheit. Perhaps different varieties of them are more cold hardy than others?